May 4th is みどりの日, or Greenery Day. A national holiday, and part of the string of holidays known as Golden Week. We have been having some wonderful weather recently, the kind of warm, sunny days that in the UK in August would make a lovely summer. I spent most of today at home, with all my windows open. I did some laundry, I did a bit of spring cleaning, I just enjoyed being at home. My neighbours were also at home. Now, I have lived here for almost seventeen years. I have never had a conversation with any of the people who live next door, but I am aware of their activities daily. Their house is quite large, and an elderly woman lives on the first floor. The second floor is home to a couple in their fifties, I assume either the son or daughter of the elderly resident downstairs, and their spouse. They are sometimes visited by their son, a man in his late twenties, and his toddler daughter. I am wary of these people, because they can be inconsiderate to the point of being quite antisocial. I have seen the visiting son try to start a fight with a delivery man. Last year they arranged to have their house encased in scaffolding during Golden Week, with no notice given to neighbours. Someone regularly plays the piano after 11pm and uses a hairdryer at 2am. One of the things that makes the second floor residents happy is wind chimes. 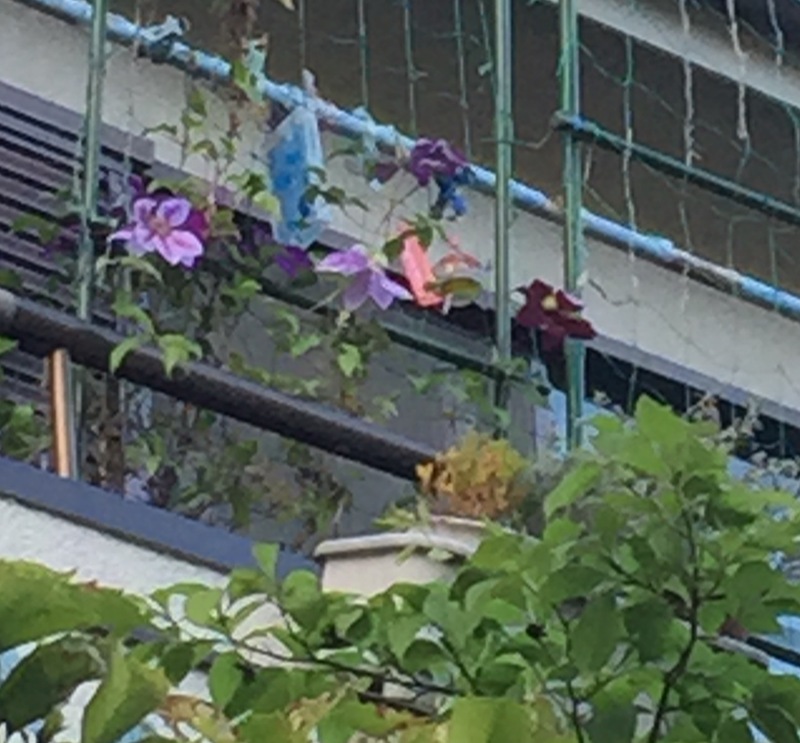 The photo at the top of this blogpost is their balcony, and you can see that they are well into the swing of summery behaviour already; plenty of greenery, a mosquito-repelling implement and wind chimes. Wind chimes plural. Because if one wind chime can enhance a summer’s day with a pleasant, occasional tinkly sound, then surely more wind chimes will enhance the day even more. Last week the first wind chime was up. Today I opened my windows and noticed that there was clearly more than one. I went outside to conduct surveillance and confirmed that we had moved into plural wind chime territory. Today was not really wind chime-friendly weather, since it was quite a blustery day, and so the soundtrack of my day was the frantic jangling of these wind chimes. Their record is five, we clearly have a way to go yet. I went out to church this evening; Monday evening means Evening Prayer and our newly-founded Rosary Group. A calm after the wind chime storm. Tokyo Tower was lit up on Greenery Day in every colour except green, and as usual there were a lot of people taking photos. Because it was a national holiday there seemed to be more tourists than usual and the area was quite busy. 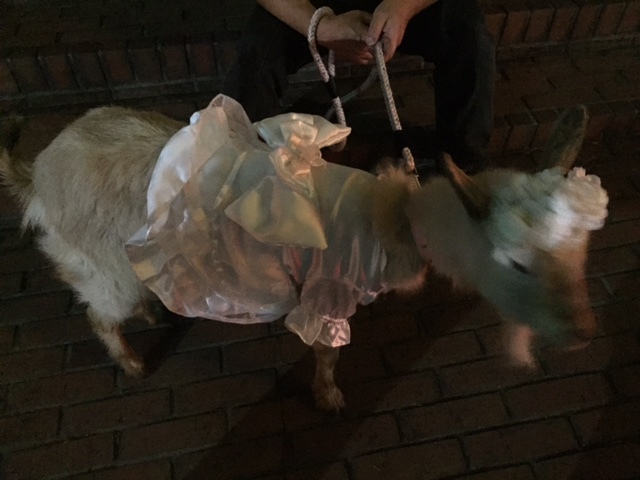 Neighbours with an over-fondness for wind chimes, Tokyo Tower lit up in a rainbow of colours, and a goat called Mero, wearing a wedding dress. Thank you, Tokyo. Especially for the goat. 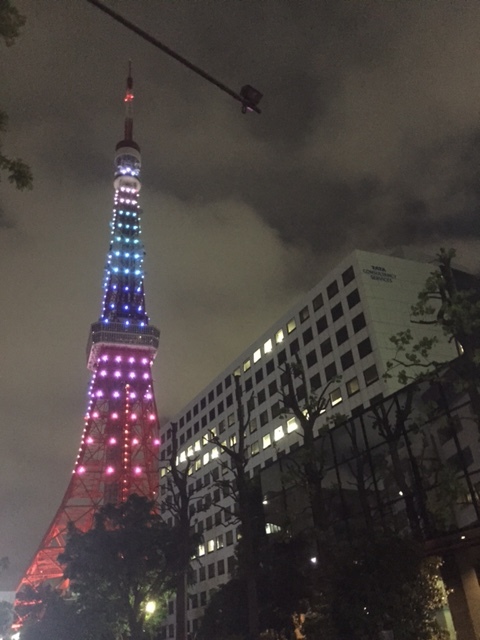 This entry was posted in Japanese national holiday, Tokyo, 一期一会 and tagged みどりの日, Evening Prayer, goat, Greenery Day, Mero the goat, Rosary Group, TokyoTower, wind chime on May 5, 2015 by tokyopurplegirl.